Colorado is gorgeous any time of the year. And the aspens haven't even leafed out yet! This view is taken from Ouray County Road 9. Ouray, Colorado, County Roads 5, 7, and 9 are overlooked because they’re not in the “high country.” Well, that doesn’t mean the views aren’t just as spectacular. Given that the high country is still closed, I’ve been exploring some of these lower altitude roads. The views are magnificent! Here's the GPS track for Ouray County Road 9, starting at Colorado Hwy 62 at the north and terminating at a trailhead to the south. The GPS track shows the location. The road is a bit hard to find—while driving west from Ridgway on Colorado Hwy 62 look for a brown “Forest Access” sign on the left—it’s not very large. If you come to County Road 24, you’ve gone too far. 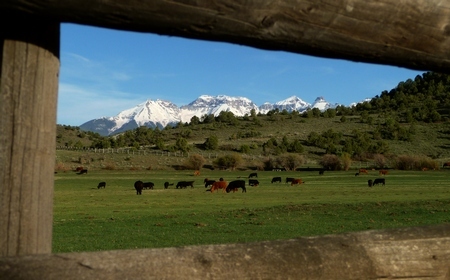 Upon turning onto County Road 9, you’ll immediately go under a sign announcing the RRL (Double R – L) Ranch. That’s Ralph Lauren’s property. Don’t worry—the road is public, but do mind to stay on the road. The map shows lots of side roads: these are all private! A little note of caution for motorcyclists: the road is highly rutted, with some ruts as much as 6 to 8 inches deep. Watch! You don’t want to get a wheel caught in a rut. If you do, as I did when not paying attention, keep your eyes straight out ahead of you and let the motorcycle do its thing. If you look down, you’ll go down! Oh, and while on a dirt bike, the position of greatest control (and greatest ability to recover from some bad footing) is while standing up. It’s important to look where you want to be and pick out your path well in advance. Look where you want to be, not where you are! 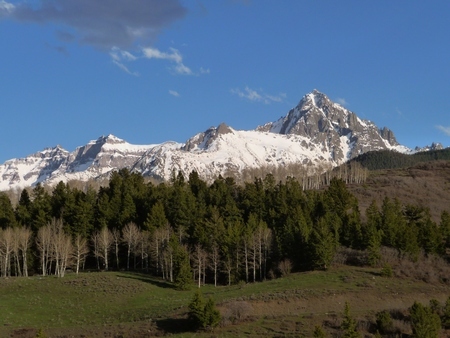 The views from Ouray County Road 9 are nothing short of spectacular. This view through the fence is taken not far from the main highway. The road is smooth—except for the ruts, which will take some time to be beaten down—all the way through the RRL. But, once you cross the National Forest boundary, that changes. Be prepared for rough, steep, rocky road with some scree. Again, keep your eyes on where you want to be, not where you are. I find this stretch of road works best in first gear. I stopped where CR9 meets the creek. The approach to the creek was solid mud, plus the creek is a bit high this time of year. On the other side of the creek is a parking area and a trailhead for a hiking trail. If you look closely in the photo, you can see a truck on the other side. I stopped at the creek. First, it was very muddy and I really don’t like mud. Second, although the creek looked fordable, the road on the other side hadn’t yet been cleared of fallen trees. 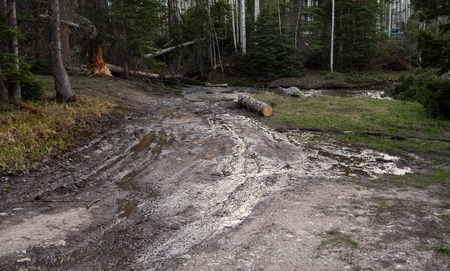 There are fallen trees everywhere—we’ve had some high winds this spring—the trees have been cleared off the road as far as the creek. Later this season I’ll cross the creek to the trailhead and snap some more pics. Oh, and the road was so pretty that I took Loretta up there in the Blazer to see the views. She was impressed, especially since we were there late in the afternoon and the light was perfect. That’s when I took the picture at the beginning of this post—and, yes, that’s Mt. Sneffels.